Some holiday cards I am working on right now. Hello everyone! I missed everyone last week. I had nothing going on so didn’t want to waste anyone’s time. 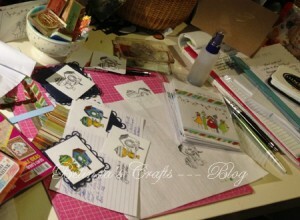 This week I am working on some new cards for the holiday season. 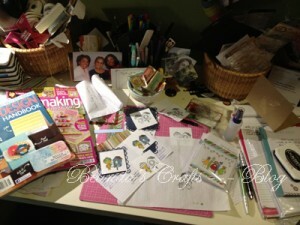 My desk has turned to it’s usual state – “creatively cluttered”. The piles have returned on top, beside and below my desk. Hence the tight shot of my desk this week. Perhaps this year I will conquer this mess I tend to make and leave until company arrives. My problem is I often don’t know where to put things. I always think, if I have them on my desk (the projects) I will finish them. Boy am I often wrong. I tend to have multiple things going on at once so it can get pretty crowded on my desk at times. Summer seems to be whizzing by and I am trying to soak it up with the boys before school starts again. To the beach is our big destination mostly for the month of August. The water is finally warm enough for my liking. This weekend looks like rain so perhaps a museum will be on our to do list for the boys this weekend. I hope you all are having fun and I can’t wait to start spanning the globe snooping on some desks. If you haven’t learned about this amazing creative journey you can take every Wednesday, then head on over to Julia’s Stamping Ground and you will find desks from all around the world for What’s on Your Workdesk Wednesday. Previous PostWOYWW – #164 – What’s behind the curtain? Plenty to see on your desk. Lovely cards. Nothing wrong with lots on the desk waiting to be done. My whole room is like that! Lots of cards in the making there on your desk. Enjoy the rest of your summer with your boys! Hi Belinda! Sorry I haven’t been by for awhile, I am trying to get back into the swing of things again! Thanks for the lovely comment you left about my vacation daybook, it is an Amy Tangerine daybook in the larger size (I think there are 2 sizes). Hi Belinda, thanks for stoppying by. I would love to have a closer look at your cards on the desk. They look really cute from here. I have missed two weeks of WOYWW. I was really busy and put in some 12 hour days the first week and then I was out of town for a birthday party and I just have not been able to get back on track this week. I have not posted anything new in that time either. But, things are changing i will post something for tomorrow. Stop by and let me know what you think.